This speech includes inspiring stories about individuals Donna personally interviewed who found their passions and are pursuing them. Audiences leave inspired to find their passion! The plus makes all the difference. achieving a passion - people skills. especially when pursuing a passion. Communicate with individuals who converse differently than themselves. Use various elements of teamwork in pursuing their passion. 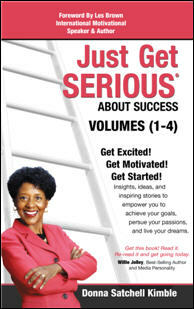 In Just Get Serious About Success (Volumes 1 - 4), Donna shares strategies and techniques which empower you to achieve your goals and to discover and pursue your passions! In Volume #1, Know Yourself & Believe in Yourself, Donna shares insights and ideas to inspire you to trust yourself, clarify your goals, and realize your life direction. In Volume #2, Discover & Pursue Your Passion, Donna shares insights and stories to inspire you to find and pursue your passion and your purpose and live an extraordinary life. Only $14.95. This exciting new book will be available online September 2015. "Donna lives with a passion and purpose! Her enthusiasm is infectious and she knows how to motivate others. As the first presenter at our event, she set the tone of the day for our seminar to be successful. I am honored to recommend Donna for others to be blessed by her. She is always a pleasure to work with!" "Your speech on finding your passion was much more than we could have imagined. We were pumped up to go back to our homes and jobs with a new direction and new attitude. I want to thank you for a great experience. It will make us all much better people." "Donna, I so enjoyed your speech and because of your message I have taken the first step in pursuing my passion. I enrolled in college and I am on the road to doing something I truly enjoy. Thank you for the large part you played in pushing me on."